Two of my favorite things in our home are our sectional sofas. Often, furniture stores will have decorating staff who will come to your house to help you choose furniture based on what you’ve already got. Well, don’t expect decorating ladies to be tickled to work with or to sell you a sectional couch. Chin out and jaw set. I want my sectional. Why a sectional sofa? With lots of room to sprawl, sectional sofas promote family togetherness. There’s plenty of room for a mom with three girls gathered around The Indian in the Cupboard and a dad fast asleep for a nap. It never fails if I sit down alone to peruse a homeschooling book, along comes a girl. Then another. Then another. Then my husband. And soon, we’re all there together, until I move somewhere else to try to read in peace. So there you have it. A sectional sofa is better than dinner around the kitchen table for promoting family togetherness. Our Lazy Boy (brown) sectional is seven years old and frazzled. The Flexsteel (red couch) is just over a year and has bones and build of steel. It’ll be that icky green couch that’s still around when I have grandkids. 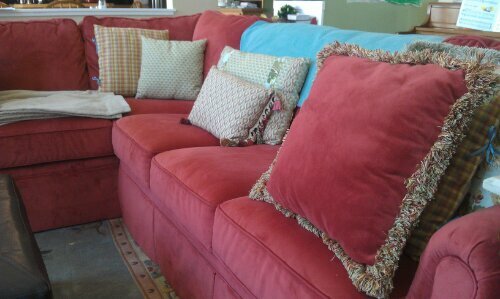 If your’e considering either brand or a want particular thought on sectionals, drop me a line if you want. All I do all day is sit on the couch and eat bon-bons. Have a good life! 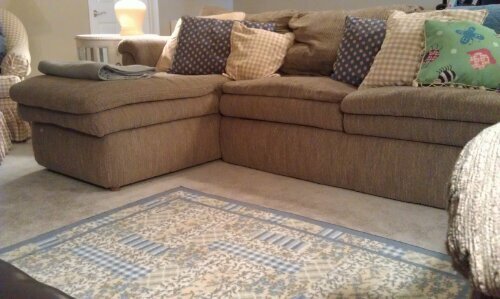 This entry was posted in For the Home, Odds and Ends, Parenting and tagged Sectional sofa, should I get a sectional sofa on March 13, 2013 by thehomeschoolingdoctor.